I was looking about the net and came across this on eBay or if you prefer, here on the FFX web site - either way they are the same price. Whist the fixed base is nothing to write home about, the plunge base is quite nice (especially as it takes 8mm fence rods and the same fine adjuster fence as the Makita RP1110c, deWalt DW613/615/621, Elu MOF96/OF97 and Trend T5, etc) and there's also a tilt base available for those who need it, so it makes this a good addition for somebody who has an RT0700, has the Mak batteries but needs to go cordless with a trimmer/small router. Does it take the normal black Makita guide bushes in the plunge base? £133 on ebay - £129 on FFX. Missed the boat by the looks of things. Thanks, I have the Katsu with plunge base and also have the Silverline set as Amazon reviews said that was the only bushes that fitted, sure, they do fit the plunge base but so do the Makita regular bushes as you mention - there appears to be no type of bush that fits the standard (round) fixed base. Not really a problem for me tbh as I mostly only use it with the plunge base on my hinge jig and for rounding over. Still think I will buy the DRT50JZ as I want to go as cordless as possible from now on and use it with the Katsu plunge base - just replaced my SP6000J with the 36v cordless version (DSP600ZJ) and that is fantastic. Have you had a chance to have a go with the cordless mitre saw from Makita, the smaller one with 190mm blade? Thanks, I have the Katsu with plunge base and also have the Silverline set as Amazon reviews said that was the only bushes that fitted, sure, they do fit the plunge base but so do the Makita regular bushes as you mention - there appears to be no type of bush that fits the standard (round) fixed base. The Porter-Cable type 2-part threaded guide bush does fit the fixed base on the RT0700 and the Katsu. Those P-C guide bushes are available in Imperial from Silverline (see previous post) and in metric from Trend (16, 16.7 and 30mm [scroll down to "US Style Guide Bushes"] - the most suitable sizes for use with router jigs) and Axminster Power Tool (10, 12, 14, 16, 18, 20, 24 and 32mm as a set). Not really a problem for me tbh as I mostly only use it with the plunge base on my hinge jig and for rounding over. 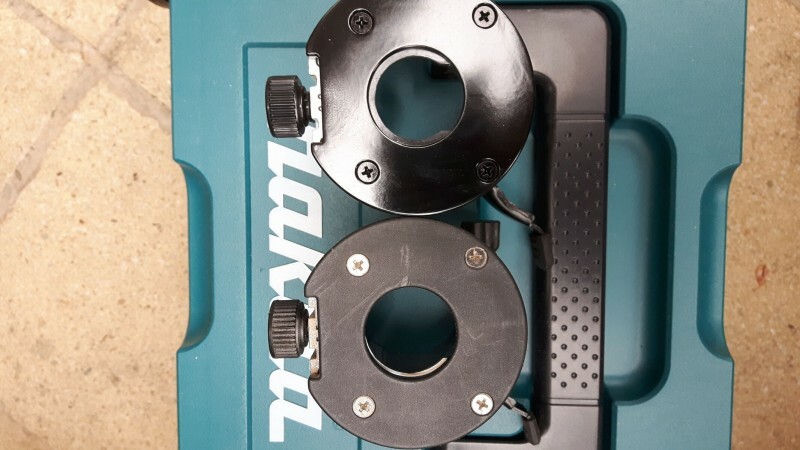 The 16mm one can be used with the Trend hinge jig and a 12mm diameter cutter, the Trend 16.7mm allows the use of a 12.7mm (1/2in) hinge recessing cutter with the Trend hinge jig and the 24mm one (in the Ax set) allows the use of a 20mm cutter in the Trend hinge jig for dealing with radius corner hinges because the standard radius on those is 10mm. just replaced my SP6000J with the 36v cordless version (DSP600ZJ) and that is fantastic. I went onto the DSP600 a few months back and have all but stopped using my Festool TS55. For site work the 2 x 18 volt set-up is more than adequate and has more than enough power (as well as never needing to go into safety mode because some moron has just plugged a 2kW angle grinder into my transformetr!) although if I were cutting all day it would still be a coin toss as to which is the better tool for the job. The one thing I didn't like about the DSP is that ultra thin blue blade that Makita supply - mine distorted the first time it hit a hard knot, so I switched to DW Flexvolt blades (42t) which sadly didn't impress me (on the other hand the DW Xtreme thin kerf saw blades were/are brilliant on my Makita DHS680 cordless rip saw), so I'm now trying acouple of Freud thin kerf blades which seem a lot better. Next thing will be a cordless/110 volt vacuum - class L (as class M is not yet made), I hope. The Porter-Cable type 2-part threaded guide bush does fit the fixed base on the RT0700 and the Katsu. I must be doing something wrong then as I can't get it to work - the bush and threaded ring just pass straight through the aperture in the base plate with nothing to fix to, the adapter plate is of course too big to work with it too. Thanks for taking the time and trouble to do the pictures etc. When you offer up the bush to the underside of the base does it come up against a flange to hold it in place so you can then screw on the locking ring from above? Sadly my fixed base must be different to yours as there is no flange on mine for the bush to hold against while the lock ring is screwed on, it simply passes straight through the base aperture. The "lip" is in the black plastic sub base, Bill. What size is yours? Any chance of a photo? Are we tslking about the Katsu here? Yes it's the Katsu. I have just ordered the DRT50 so when it arrives I will take a picture of the two side by side. For anybody's future reference here are the two bases, the Katsu is different to the Makita as it has no flange inside the base to hold the guide bush. The Katsu is the lower base, the silver part is just from the router body.